This review WILL contain spoilers. I will try to be as vague as possible with details, but if you do not want spoilers- please don't read this! I have a theory. You see, I just finished Pandemonium ten minutes ago and couldn't stop thinking about it. I NEEDED to get my thoughts down on paper. This doesn't happen very often with book reviews. My theory is this: the Delirium trilogy is similar to a puzzle. In the first book, Lena is docile, weak, and meek. In this book, Lena is the exact opposite- hard, cold, and most of all ... angry. You can see this in the covers to the books- in the first, the colors are blue. The model is wide eyed and innocent looking. On the cover for Pandemonium- the model is fierce, picking the reader apart with her angry glare. The colors are orange, red, and the plants give the model a wild look to her. Some may find this off-putting. Lena's personality seems to have made a complete 180 degree turn. But if you look at the big picture (and if my theory is correct), you can't look at one book without the other. This trilogy seems to be Lena's path to becoming a complete person. A person who has a balance of strong with week, passion with common sense, and calmness with ferocity. A complete person. Delirium and Pandimonium are those complete opposites- and I really believe book three will be the book that ties them together. As for the book itself, Lauren Oliver did a fantastic job! At first, I was bothered with how different Lena seemed since the last book (understandably so, but still?). About halfway through the book, I realized- Lena still doesn't have it figured out yet. She will, but she is still struggling to find a balance between the "wild" and the "order" in herself. 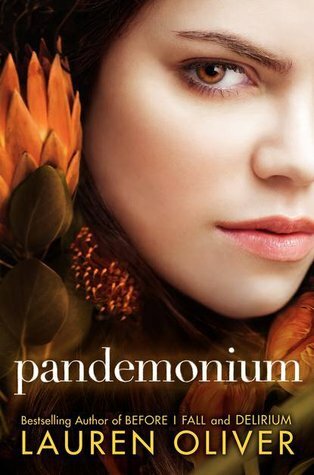 Yes, there is a second love interest, and yes he is important, but I don't really think that that is what Pandemonium is really about. Pandemonium is more about Lena's journey and how far into "wild" she is willing to go. I hope you will all read this book when it comes out- and when you do get a chance to read it, hop back here and let me know if you agree with me. I, personally, can't wait for the third book. I applaud the author for her complex story lines and most of all- for making me think about what makes up a "good" person. Wanted to read this review so bad, but I stopped myself when I saw the word spoilers. I only read the last paragraph. Can't wait until it comes out! I think it's only a spoiler if you read the firsts, after reading this review I still feel clueless enough to want to k ow more and curious enough to want to read it. Thatnkfor sharing. Cannot wait to check this one out as soon as I get my hands on a copy! I read Delirium a couple weeks ago, and I cannot wait to read the second book!